Former longtime assistant football coach, Gateway High School Teacher and Gateway Sports Hall of Fame member Steve Milos Klipa, 72, of Monroeville, died suddenly on Monday, Dec. 20, 2004. Justin King, along with Central Catholic's Eugene Jarvis, were named as the 2004 Pittsburgh Tribune-Review players of the year. LB/RB Mike Barlak was named to the Trib's "Terrific 25", and OL/DL Matt Houy was selected to the AP Class AAAA All-state team. Congratulations to the honored Gators! The Lady Gators hoops team is off to a quick start at 5-0. Tonight, Coach Bruce-Scott's lady Gators will take on the Penn Hills Indians at the Gateway Athletic complex. Penn State Football Coach Joe Paterno is expected to be in attendance after spending the afternoon with Justin King. 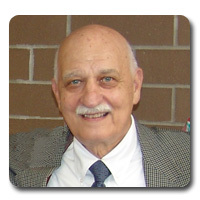 On Friday at halftime of the boys basketball game against Penn Hills, the Gateway Sports Complex will be formally dedicated to the honor of former coach Henry Furrie. You are invited to attend! Congratulations Gators on a great season! Gators Justin King (L) after the game - Last time in a Gators uniform. John Gay, Dan Loheyde, Justin Colbaugh and John Washington listening to Coach Smith post-game. The Gators season came to an end this evening as Pittsburgh Central Catholic defeated the Gators 28-0. The Gators offense could not get in sync and could only manage 120 yards in the game, 111 of which were Justin King rushing yards. The shutout against Gateway marks the first time since 9-21-2001 that the Gators were blanked. Thanks for a great season to the team and coaches. 11-2 and WPIAL AAAA Runners-up is quite an accomplishment to build on for next year. 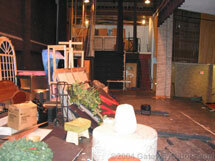 GatewayGators.com would like to thank all the visitors to our web site, the Gateway School District, Gateway High School administration, and Gateway Football for making this all possible. 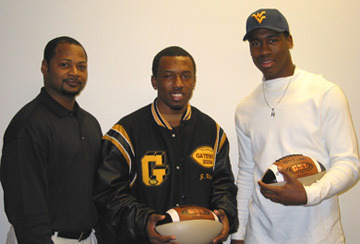 Congratulations to Gator Justin King, who was selected as the 2004 Gatorade Pennsylvania Player of the Year! Congratulations to Mike Barlak and Justin King! The Pittsburgh Post-Gazette selected their "Fab 22", and we're pleased to announce that Gators Mike Barlak (LB/RB) and Justin King (RB/DB) were chosen. Congratulations to both of the Gators' choices! Pam Hartwick (in center, seated), flanked by her parents, Coach Greg Taylor, and AD Terry Smith watch the National Letter of Intent signing. Pam Hartwick, a three year starter for the Gateway Softball team, signed a National Letter of Intent this morning to attend Indiana University of Pennsylvania on a softball scholarship. Pam led Gateway to an 11-7 record, a spot in the WPIAL Class AAA quarterfinals, and a berth in the PIAA state tournament, which was the Gators' first appearance in the PIAA bracket since 1997. Pam had a solid season, posting an 11-6 pitching record with 68 strikeouts and 32 walks, 11 of which came in the first 2 games of the season. Pam finished with 114 innings pitched and a 2.57 ERA. Offensively, she had a .410 batting average, scored 10 runs and had only 10 strikeouts. Please join GatewayGators.com in wishing Pam congratulations on her scholarship! Justin King commits to Penn State! At a press conference attended by more than 200 friends, family, teammates, and media, Justin King named Penn State as his college. The 2004 Quad SouthWest All-Conference selections were revealed, and 9 Gators have been named to the 1st team. Click here to see the complete list of selections. John Sattler, a 1967 Gateway Grad and star athlete who was class president, captain of the football team and lettered in wrestling at Gateway High School is the commander of allied forces in the battle on the terrorist stronghold of Fallujah. General Sattler, who as commander of the 1st Expeditionary Force leads a force of nearly 40,000 troops, has served in the military for more than 30 years. Sattler will be one of the class of 2004 inductees Saturday night at the sixth annual Gateway High School Sports Hall of Fame dinner at the Alcoma Golf Club in Penn Hills. GatewayGators.com and the Gators family would like to send our blessings and best wishes to Gen. Stattler to lead our troops to a decisive victory. Gators RB/DB Justin King will be featured on a special Fox Sports Pittsburgh program "JUST ANOTHER DAY WITH JUSTIN KING", Friday, November 19, 2004 at 10pm. Fox Sports Radio to broadcast live from Gateway High School on Friday! The Fox Sports 970AM radio show "In the LOCKER ROOM with TUNCH and WOLF", will be broadcasting live from the home of the Gators, Friday, November 19, 2004 from 7-10am. We remind you that it is highly recommended to purchase your tickets in advance. To accomodate the interest in this game, we have decided to have EVENING HOURS tonight at the Gateway athletic office for after-hours ticket sales. 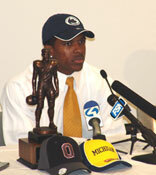 Justin King will announce his college choice this evening (Nov. 15, 2004) at 7pm. The press conference will be held at Gateway High School in the LGI room at 7:00pm and will be covered by most major media outlets. We'll be there and will have the site updated as soon as the announcement is made along with photos and video. With over 60 scholarship offers, Justin King has narrowed down his list to 4 - Florida, Ohio State, Michigan, and Penn State. King has rushed for 1,667 yards and 29 TD's this season to lead the Gators rushing attack. In his career, King has 4,286 yards rushing and 58 TD's, a career rushing average of 8.69 yards per carry. Justin King, Senior Tailback/Cornerback for the Gateway Gators, is considered the #1 Pennsylvania high school player and is widely considered the #1 Cornerback prospect in the country. King is ranked in the top 10 high school players in the country by multiple news services. 4 new wallpapers available Oct. 13, 2004. Designed by Coach Larry Gholston, four additional unique Windows Desktop Wallpapers are available for Free Download! There are a total of 8 different designs that you can download for free. In preparation for the upcoming 2004 Gateway Hall of Fame Banquet, we are pleased to be able to have Coach Walter "Pete" Antimarino's full bio online. 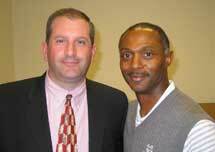 Justin King will announce his college choice on November 15, 2004. GatewayGators.com will be there and have full coverage of the announcement as it happens. With over 60 scholarship offers, Justin King has narrowed down his list to 5, and has visited on campus at Michigan this past weekend, and has future on-site visits scheduled with Florida (10/2), USC (10/16), and Penn State (11/6). Justin King, Senior Tailback/Cornerback for the Gateway Gators, is considered the #1 Pennsylvania high school player and is widely considered the #1 Cornerback prospect in the country. King is ranked in the top 10 high school players in the country by multiple news services. King has 965 yards rushing and 22 TD's in 5 games for the Gators. The WPIAL brackets have been released, and our Gators have been seeded as #2 and will take on #15 Connellsville this Friday at Antimarino Stadium. CALLING ALL GATORS FOOTBALL ALUMNI! Send a note of encouragement to the 2004 Gators team! Click here and send the team a note! 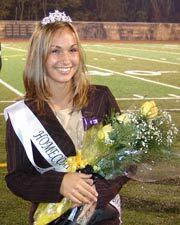 Congratulations to the 2004 Homecoming Queen Jillian Kalkstein! Six super teams will take to the Field Turf at Gateway's Antimarino Stadium to compete in the 1st Annual Pennsylvania Kickoff Classic. Tickets are $10 and available online right now. Each $10 ticket gets you into all three games! GatewayGators.com will be there and will have photos from all three games. The "Big Game" is only hours away... and GatewayGators.com is here to provide you with all the pre-game buzz surrounding his huge matchup. It's only 9 days until the Walter "Pete" Antimarino Stadium dedication - and big game against Pittsburgh Central Catholic on Friday, August 27. If you are a former Gator Football Player - YOU ARE INVITED to join us on the field for this special event! 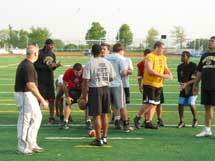 We also need your help --- Please contact ALL the former Football alumni and invite them! 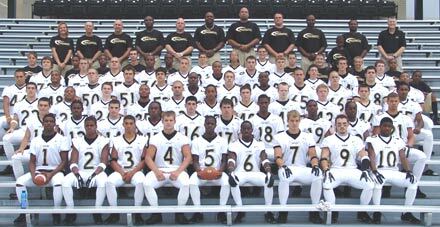 Your 2004 Gateway Gators Football Team! 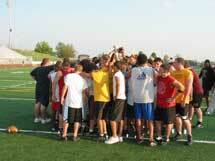 Gateway will hold its first scrimmage of the year on Saturday, August 14, 2004 at 10am versus Butler at GHS stadium. Join us at the stadium to cheer on the Gators! Admission is free - concession stands will be open. Friday, August 20th @ 5pm in the Sports Complex. Any student entering 9th through 12th grade is elibible. Interested students should contact the athletic office @ 412-373-5750 for more information on tryouts. GatewayGators.com will soon be launching a new online "Gateway Alumni Network" for Gateway Alumni to register, find lost friends, etc., as well as announcements and registrations for upcoming alumni events. If you would like to list your Gateway Alumni reunion or event (there is NO charge for this), please drop us a note. We are also going to be selling Gateway Gear - shirts, hats, and more from our online store. We'd like to know what items you'd be interested in purchasing. 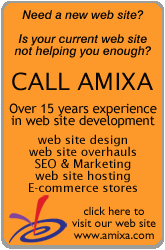 Please give us your feedback. Buy Gators Football Tickets Online! Tickets to GHS football are NOW ON SALE!. In cooperation with Gateway Athletics - you can purchase 2004 Gators football tickets - including season tickets & KickOff Classic tickets online securely using your credit card. 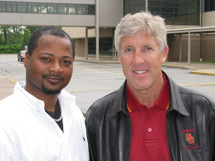 Gatewaygators.com and Coach Terry Smith are pleased to announce the signing of two former Gator football players. An offensive lineman most of his career, the 6-foot-2, 230-pound Zack Smith was converted to tight end between his junior and senior seasons and was named to the 2004 Quad South Second Team at tight end. Zack is going to Westminster College. Kyle Knight, who will be attending Fairmount State University, played Gateway football for 5 years and had his first start his senior year. Kyle only received on letter that was from his senior year and always played right Guard. Kyle also was named First Team All-Conference, and one of the top 30 high school football players in East Suburbs. Now available for online purchase through our Gators Store, the 2004 Gators Football Gold Card (discount card for use at various Monroeville & Pitcairn businesses), 2003 Highlights DVD and 2003 Multimedia CD-ROM. COMING SOON: A full assortment of Baseball Caps, T-Shirts and more! Gateway will play host to the first Pennsylvania Football Kickoff Classic, showcasing three games, North Hills vs. Bethlehem Catholic, Central Catholic vs. St. Joseph's Prep, and the finale of Gateway Gators vs. Woodland Hills. In other news, the season-opening game versus Central Catholic has been switched BACK to Friday night, August 27, 2004 at 7:30pm. 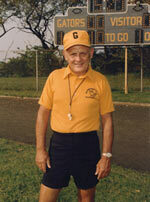 A stadium naming ceremony will be held prior to the game to name the stadium after Walter "Pete" Antimarino. ALL Gateway Football alumni are invited to join us on the field for the stadium naming ceremony. Matt Houy led all Gator football players by bench pressing 405 lbs. (pictured left). 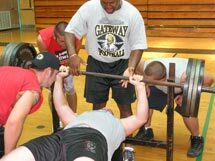 The 2004 Lift-a-Thon was a success with more than 15 players benching over 300 pounds. View the photos here. Congratulations Gateway Class of 2004! Photos from our final stop at the spring Mini-camp are now online! Virtual Tours of the exterior of Gateway High School stadium and the front of the high school. Gateway will be holding its 3rd annual football camp for grades 3-9. 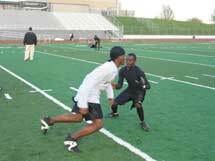 The camp will be held June 8th thru June 11th at the newly renovated Gateway Stadium, and features high school and college players as mentors, daily special guest speakers, and more! Download the Camp Brochure and registraion form here. Mini-Camp is underway and GatewayGators.com is there to capture the action! Talks are underway to start a new "Kickoff Classic" football showcase at Gateway High School's renovated stadium this Labor Day weekend, featuring 4 games and 8 high profile teams battling it out. 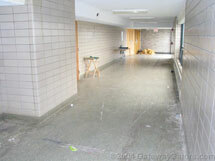 We are now offering Virtual Tours of the High School that are under renovation. Gateway High School and Coach Terry Smith are pleased to announce the signing of three graduating Gators football players. Corey Sattler 6â€™ 173lbs. WR has signed a letter of intent with Johns Hopkins University. Corey was a 2nd team All Conference player and an East Elite 30 selection. Corey maintains a 4.15 QPA and is ranked 16th in his class. Corey has led Gateway the last 2 years (cumulative) in receptions, touchdowns receiving and yards receiving. Jason Warning 6â€™5â€� 305 pound offensive tackle has signed a letter of intent with IUP. Jason was a 2-year 2nd team all-conference lineman. Eric Wofford has signed a letter of intent to Slippery Rock. Eric was a 2-year starter and 2-year 1st team all-conference selection. He had 8 career interceptions with 3 returned for tdâ€™s. The Gateway Varsity Football 2004 schedule has been released, and among the teams Gateway will play will be PIAA-AAAA runner-up Central Catholic, and WPIAL-AAA runner-up Thomas Jefferson. View the schedule here. The Gateway Gator football team is proud to announce the following selections to play in the annual Foothills Football Classic on June 19, 2004 at East Allegheny High School. We are very proud of these players accomplishments and wish them well with this game and all that they desire to do. The new conference alignments have finally been determined. Gateway will be in the new "SouthWest" conference. We have full coverage including geographical maps! Congratulations to Mortty Ivy & Jai Wilson! 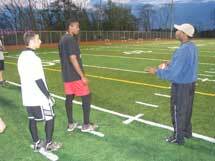 Wednesday, Feb. 4, 2004 - Gateway Sports Complex, Monroeville, PA: Today was a Great Day for Gator football! Mortty Ivy, signed with West Virginia University, and Jai Wilson signed with Morgan State University. Jai Wilson set two Gator single-season records: Yards Receiving-835 and Yards Per Catch, 30 yds/catch. Ivy set the Gateway single-season td passing record - 19 td's and 0 int's, and generated 2,004 combined passing/rushing yards. Also recognized was Justin King who smashed the Gateway single-season rushing record to finish with 1,763 yds. and 29 rushing td's. On November 8, 2003, seven Gateway greats and one team were inducted into the Gateway Sports Hall of Fame. You can be part of history! Support the building of our Gateway Hall of Fame, and get a black & gold tile with your name on it! Now available, schedules and results for Gator basketball, wrestling, and ice hockey!